9-year-old Mariyam has not been able to go to school for almost a year now. She eagerly waits to get back to school, and meet her friends. She gets restless at even the thought of the games her friends would be playing, or of how much fun she is missing out on. Mariyam got Cancer last year, for the first time. It was in January 2016 that a stubborn fever led Mariyam’s family to the doctor. When tests revealed that the intensity of the problem was much greater than expected, the family was referred to Manipal Hospitals.The blood samples were sent to Delhi for evaluation. When it returned, Mariyam’s parents were shocked and heart-broken. The little one was suffering from Blood Cancer.The little one underwent chemotherapy for 6 months. Mariyam’s father Hassan sells clothes on the footpath for a living. His income was just about enough to make ends meet for his family of 5. He borrowed from his friends and family, and acquaintances who worked in the middle-east. During Ramadan, they even some mosques and collected around 10 Lakh. The chemotherapy helped, and Mariyam recovered soon but she had a relapse of Cancer within a year. In April 2017, Mariyam’s Cancer returned. In a moment, all the efforts Hassan had made looked futile. He had hardly been able to heave a sigh of relief. Meanwhile, Mariyam had just re-joined school. It was already time for her to leave her friends and return to the terribly slow and painful life in the hospital. This time, it broke her. The little one just became silent and withdrawn, almost as though she were giving up on herself. However, she does have a chance. A Bone Marrow Transplant can cure her completely. She can live her life without worrying about it ending. 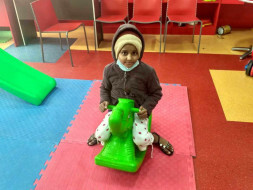 Little Mariyam can get her childish giggle back only with the assurance that Cancer will not come back to her life. A Bone Marrow Transplant can give her that. 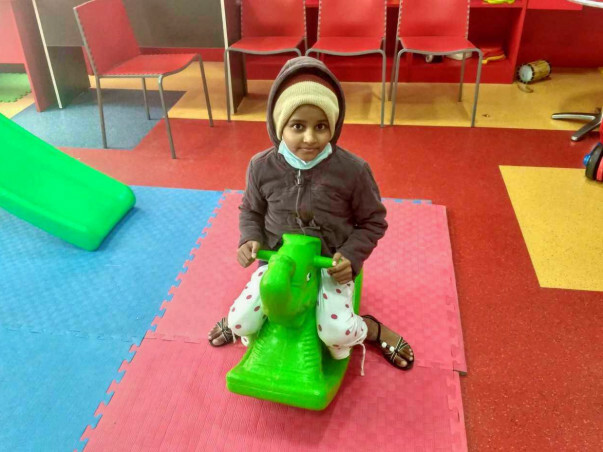 By making a contribution to this campaign, you will participate in giving 9-year-old Mariyam a Cancer-free life. She is too little to be worried about dying. After six months of battling cancer, we received the news from the hospital that Mariyam passed away yesterday. We'll get in touch with the clinical team and will be sure to keep you all informed. 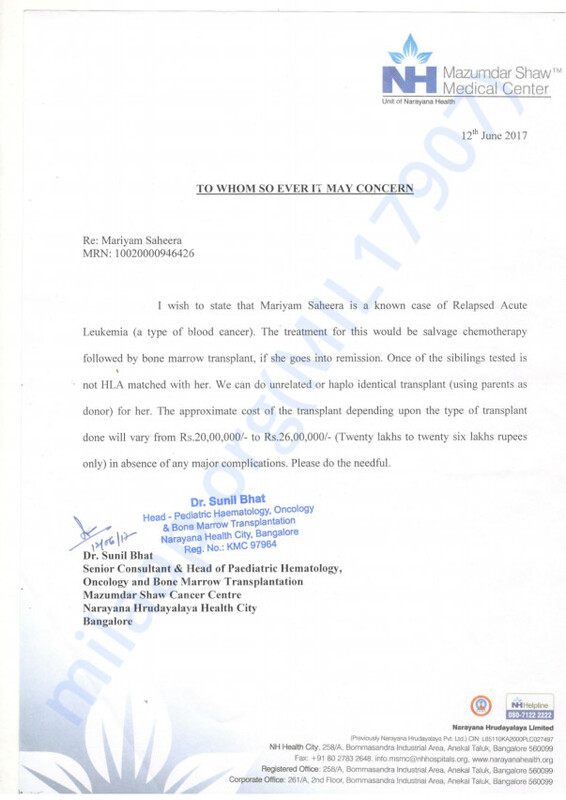 Part of funds raised (~Rs 6 Lakhs) was already transferred towards her treatment. We are awaiting further details and expenditure on the treatment and will transfer the balance upon receiving the same. We thank all the donors for supporting the little one. Our prayers and heartfelt condolences are with the family at the moment.